1st Lt. Harold Eugene Knudsen Jr. In the six months he served in Vietnam, Harold Knudsen flew 140 missions in his Phantom F4-C fighter. He had earned seven air medals and was headed for a promotion to captain. On Sept. 14, 1966, however, his jet crashed while he was flying an air strike near Phan Rang. 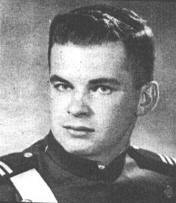 According to his wishes, Knudsen was buried at the Air Force Academy in Colorado Springs, from where he had graduated in June 1963. Four years earlier, in 1959, Knudsen graduated from Paradise High School. He was president and a life member of the California Scholarship Federation, played football, ran track and played in the school band. Not only was Knudsen active in school, he was also a member of the Paradise Order of Demolay and an Eagle scout. Knudsen, who was born in North Dakota, moved with his family to Paradise in 1955.